Textularia sp., from the US Geological Survey. 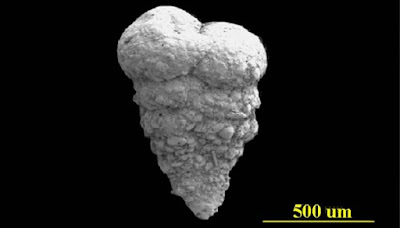 The Textulariinae are a group of agglutinated Foraminifera known from the Carboniferous to the present day. The test is initially planispiral in members of the subfamily Spiroplectammininae, becoming biserial in later stages; in members of other subfamilies it is biserial from the start though it may become uniserial in later stages of Textulariinae (Loeblich & Tappan 1964). Characters (from Loeblich & Tappan 1964): Test free or attached, may have early planispiral coil, generally biserial and may become uniserial; wall agglutinated; aperture simple, basal or terminal, single to multiple.